A month after drawing the Martyrdom of St. Crispin, Nast returned with another unflattering cartoon about the Chinese entering the shoe making profession. Here Nast takes advantage of several puns. A demonic Chinese laborer is at his cobbler’s bench, he has replaced St. Cripin as the cobbler. Western-styled shoes in various stages of progress surround him, but the Chinese man does not wear the product he makes. The Chinese artisan wears his native mandarin jacket and loose pants. Nast will always draw the Chinese in native dress, including Chinese footwear, often with thick grass or straw soles and topped in cloth or hide. The cobbler is clearly annoyed by the soul or “sole” of the displaced St. Crispin, the Catholic patron saint of shoe cobblers and leather workers. The insect, named St. Crispin, is not happy. He is distressed to see a Chinese take the place of his usual patron, a Christian or Catholic white shoe cobbler. A halo hovers over its head, formed as the heel of a shoe. Its large wingspan is troublesome. Two of its six legs are clenched in fists, ready to attack the foreign cobbler. The Chinese man cowers at the insect’s arrival. Because his large hat or douli hangs on the wall out of reach, he grabs the closest weapon he has, the end of his long queue to swat or “shoo” the shoe fly away. The shorter hairs on the top of his queue bristle. It is hard to determine if the cobbler is angry or afraid His posture would indicate defeat, but his expression, particularly the raised eyebrow and sideways glance, indicate a determination to get rid of the pest. A partially opened umbrella stands at the opposite end of the bench. He clearly wants to be left alone to sell his “Cheap Shoes” to the public. In case the message is not clear, “Cheap Shoes” appears twice in the cartoon. Because Chinese workers were considered cheap and often slave or “coolie” labor, they were able to undercut the prices of their competitors. The Chinese were in fact brought in as strikebreakers against the interests of the Knights of St. Crispin labor union. See Martyrdom of St. Crispin. In Massachusetts, threats of violence and rock throwing were thwarted by heavy police protection. Nast’s signature, which varied in its placement and size in his cartoons, was prominently shown on a large rock at the foot of the cobbler’s bench. Nast typically had many options to insert his signature. By placing it upon the rock, does it mean he is willing to throw the first stone? Harper’s Weekly sided with pro-capitalist positions and therefore consistent as a pro-Chinese publication. Like a the majority of post-Civil War, eastern Republican dailies and weeklies, Harper’s viewed the overall benefit of trade and utilizing a Chinese workforce to benefit progressive American venture capitalists. In their view, the Chinese benefit to business interests outweighed any concerns that Democratic labor might have (Tchen 181). That summer in the streets of New York City, Mayor Oakley A. Hall, a Tweed associate and inside member of the Tammany Ring, spoke before a rally. Oakley joined many pro-labor speakers who convened a rally to fire up “The Chinese Question” among the workingmen constituency in the city. “Hall opposed the “importation of tawny slaves” by the “wicked combination of capitalists” and “man-stealers” (Tchen 179). The outcry from these rallies often blurred the distinction between willing competitive labor, cheap labor and coolie labor. Democrat charged the Republican leadership with hypocrisy – a group who fought against slavery, but were too willing to use slave labor in the Chinese. Other New York papers, particularly the New York Herald, with largest daily readership in the nation, went back and forth on its opinion of the crisis. Its editor, James Gordon Bennett held his finger to the political wind and initially “waffled on the Chinese laborers, but ultimately landed for tolerance on the Chinese question” (Tchen 181). Disagreements and concerns between labor and capital interests never reached the sustained conflicts that were soon to be stoked in California Sand Lots later in the decade. Capitalists on the West Coast did not have an alliance of local media to alleviate concerns and or suggest positive images on behalf of the Chinese. But in this cartoon, Nast had yet to find conviction with his position. He decided to portray cheap shoes and cheap labor through the eyes of the Chinese’s detractors. If Nast meant to poke fun at white labor, it was a cheap joke, made at the expense of the Chinese. 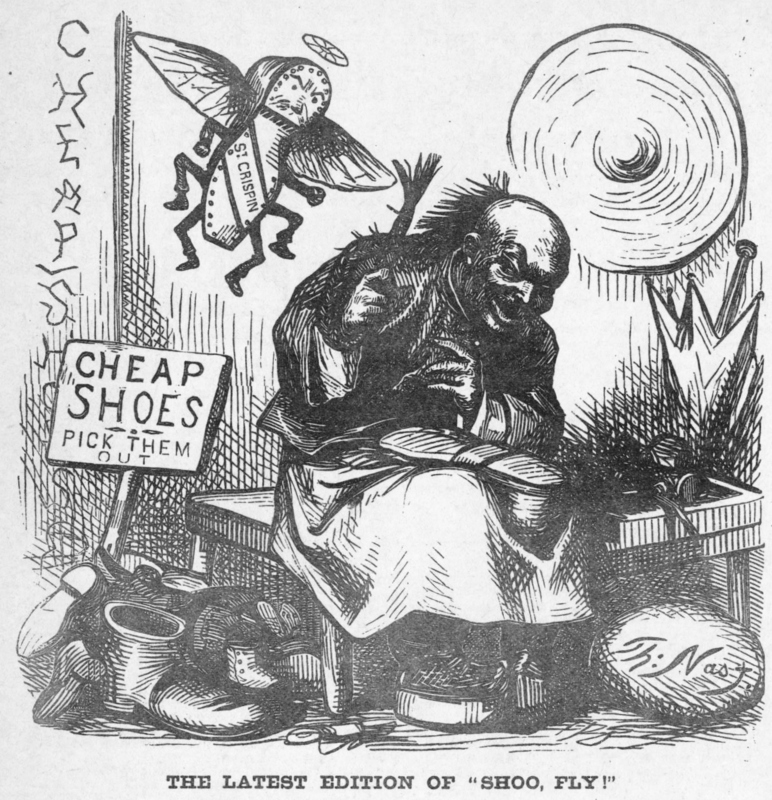 In 1870, as the shoemakers controversy trampled up and down the East Coast, Nast appears to have been swept up in their sentiment and found a use to exercise satire. This example is not representative of his evolved sensibilities that Tweed’s alliance with white labor interests helped only helped to focus. ¹For more explanation on Irish-Chinese conflicts click here.